Happy Friday! I can’t believe that it’s already time for the first runfessions post of the year. This month is certainly going by quickly! Have you heard about this show on Netflix? Marie is the author of The Life-Changing Magic of Tidying Up: The Japanese Art of Decluttering and Organizing. I haven’t read the book but I’ve heard a lot of positive reviews about it. In her show on Netflix, she visits people in their home to help them organize everything in their home via the KonMari Method. Marie is super positive and upbeat and by the end of each episode, she’s had such a positive impact on the people that she helped. Through organization the people have a new sense of calm. In doing her method, she says you should only keep items that “spark joy”. I can literally see how using this theory in everyday life would be so beneficial. If you haven’t seen the show, I highly recommend it! For the Peloton Winter Launch Challenge you basically need to do one class on the app per day. Classes range from 5-60 minutes and you can pick from spinning, running, walking, meditation, yoga, boot camp, stretching, cardio and strength classes. This challenge is making me branch out from just taking the spinning. I’m enjoying getting introduced to new instructors by taking different classes. Honestly the Peloton digital app is amazing. The amount of classes that they often is insane and I have loved every single instructor so far. This could easily replace a gym membership in my opinion. I runfess that I think my sneaker search might be over..
As a BibRave Pro I get the opportunity to represent BibRave at selected races. I applied and got accepted to participate in the Detroit Free Press Marathon weekend. Granted it’s the weekend after the Chicago Marathon, so it will be more of a shuffle vs. a run, but I’m super excited! This race has been on my bucket list for a few years. I attended grad school at Michigan State University and used to drive down to Detroit almost every weekend so I’m pretty familiar with the area. Also their International Half Marathon crosses over into Canada. How cool is that?! If you would like to sign up for this race, you can use promo code 2019DETROCKS to save 10% off any race distance. I think the app is great, but I just need a break. For the past few weeks I’ve been in 3 different “games” simultaneously. The games give me a lot of motivation to get moving, especially at work, but it will be good to not have the pressure to hit a certain step goal 6 days a week. Do you have anything you want to runfess for January? Detroit? Hmmmm. I definitely do want to do a Fall half, since I probably won’t do a spring one, but I must admit Detroit doesn’t really sound enticing to me. When I think MI I think of Mackinaw . . . . which I’ve never been to — never actually been to MI, just the airport. I haven’t tried the Ghost sneakers but I know a lot of runners that love them! Detroit is definitely a little bit of a weird city, but if you just stick to the downtown area, especially near the sporting arenas, it’s pretty nice! I’m having a lot of good luck in my Brooks Adrenalines! Still trying to love my Mizuno Wave Inspires. I have an extra pair, so I have to make them work. Are you running the Detroit half or full? I’ve heard it’s a great race no matter what distance! I’m still so mad at Mizuno for changing up the Wave Inspire SO much from previous models – it’s disappointing. I didn’t know if Brooks sneakers would work for me but I’m very happy so far with the Ravennas and Adrenalines! 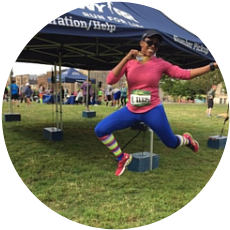 I’m doing the half marathon – well it will be more of a shuffle since Chicago is the weekend before, lol. Interesting on the Brooks. I’m wearing them for shorter runs, but still have Mizunos for my long runs. Wow on Detroit! That sounds like fun. Detroit should be fun! I haven’t been there in over 10 years so I’m sure things have changed a bit, hopefully for the better. I did find the first 2 episodes to be a little boring, but then I got into it more. I agree that not everything can spark joy, lol. If anything, I’m just glad it makes people want to organize stuff a little more. Surprisingly, my hubby wants to watch the Marie Kondo series. I say “surprisingly” because this is the man who can’t throw anything away. He has all of his race shirts. Can’t donate any of them even if he doesn’t wear them. We have all of our canceled checks, going back to when we were first married (1978). Seriously! LOL it might be a very good thing for him to watch the show! I do understand that sometimes it’s hard to part with something, especially if it has sentimental value. Total #KimTwinning here with the shoes 😉 I’ve been a huge fan of the Adrenalines ever since my first pair (fall of 2015). I’m not giving up hope on the Wave Inspires, but for now the Brooks have my heart (and soles). I love my Brooks and I am hooked. That Peleton Challenge sounds pretty cool. It’s giving em the opportunity to try out different classes which is nice! Good luck on the shoe search. I’ve given up looking and just stick to my NIkes. I’ve always loved the look of Nike sneakers but they don’t have enough support for my knees. I am usually a mizuno girl too. I love the Wave Riders, but this last time I got a pair of Brooks to switch off with. So now I’m a Brooks girl too. I never thought I would make the switch to Brooks but I’m pleasantly surprised that it’s working out so well. FYI my half marathon PR was run 6 days after running the Chicago Marathon. So there’s that. Glad I’m not the only one who has struggled with Mizuno lately. I wish I could say I had a long run shoe for Tokyo but that would be a lie. Thanks for linking! That’s good to know about your half marathon PR coming so soon after your marathon. Maybe I’ll have similar luck! I know the struggle with finding a long run sneaker – I hope that you are able to find one soon for Tokyo. It’s great that both the Ravana and Adrenalines are working for you! I really like the Adrenalines so far – are you using both equally or do you favor one shoe more than the other? I’m trying to use both equally now since most of my runs have been 5 miles or under. The real test will start once I get to double digit runs! OKay, I feel like I am the only one who isn’t wathing that organization show on Netflix. I guess i need to check it out! Have a good weekend! I have also read several articles about people just getting rid of junk and ‘donating’ it and causing more issues for donation places like the Salvation Army and Goodwill. Congrats on getting into the Detroit marathon! I will admit that I didn’t get into the show until around episodes 3 and 4. The first 2 were a little boring. I did read online that the thrift stores are getting so many more items now, but they said it’s a good time to go shopping there! Thanks! I’m excited to run that race in Detroit. I love my Brooks Ravennas! At first I thought it was all hype but I really enjoyed the first episode of Tidying Up and was inspired! Even Bret got into it! The Peleton looks amazing, I will have to live through you! Detroit sounds great and that’s cool the course goes through Canada! Hopefully you’ll have great running weather! It’s so easy to get inspired by that show. It literally makes you want to organize everything! Yes, hoping for good running weather for my races this Fall! I’ve heard about Tidying Up, but haven’t watched it. My husband and I have both been on a major throwing stuff out tear lately so maybe I can be even more inspired watching it! Don’t you hate it when the updated shoes you’ve loved for years just don’t work and you have to find something else? Glad you’ve found Brooks that you like! Totally! The show will inspire you to do even more cleaning and organizing! I really hate when companies make such drastic changes to shoes from version to version – it’s so frustrating!! finding the right shoe is so hard! just know it’s very ok to switch if it’s better for you! you are not cheating haha! very cool about the DFP! I would love to run that one day! have always heard good things about it! I’ve heard great things about the Detroit race too – it should be fun! Glad you found some shoes that are working for you – it’s frustrating when old favorites change too much! A Brooks model was my second choice when I got fitted for running shoes, but Altras have been working for me for a few years so I don’t have any urge to try another brand. The International Half Marathon sounds fun! Will you be doing that the weekend after a marathon, or sticking with a shorter distance? I have a few friends that tun in Altras and they love them! Yes, I’ll be doing the half the weekend after the full, so basically I’ll be shuffling and walking the half, lol. The right sneakers are so hard to find! I have been a long time Asics girl, but I have found Mizuno Waves work well too!! Yup, it’s definitely a process! I’m just happy that for now I seem to be running well in the Brooks sneakers I selected. I will definitely send my good sneaker mojo your way! It’s so hard to find the right sneaker.